Blepharoplasty surgery (eyelid tuck) is performed to cosmetically and functionally rejuvenate the eyelids and associated structures. By rejuvenating the eyelids, patients look more alert, awake and refreshed. As we age, the skin and muscle associated with eyelids become loose and baggy. This produces a sad and saggy look that makes us look old and tired. In addition, tissues that separate the cushioning fat around the eyeball become weak and fat protrudes into the eyelids forming bags under the lower eyelids and making the upper lids appear thick. Cheek implants have numerous advantages over other methods of restoring midface volume. Fillers and fat will dissolve over time. Fat and permanent fillers will droop over time, worsening the problem and cheek or midface lifting procedures will sag over time. Cheek implants are fixed to the cheek bones with tiny micro screws, so they will always remain in place and not droop. This makes them the only three dimensional method of cheek rejuvenation that is permanent and won't move. Perhaps the biggest advantage is that if the patient does not like them, they can be removed in 5 minutes! There are not many options that are both permanent and reversible. 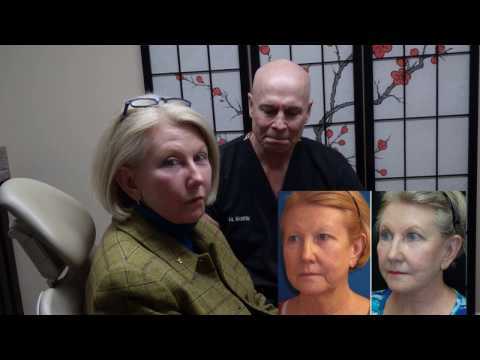 Facelift surgery is Dr. Niamtu’s clinical passion and signature procedure. Dr. Niamtu performs every single step by himself from the first cut to the last stitch. There is never a doubt about whom is doing your surgery. Dr. Niamtu only performs face and neck surgery which allows him to focus his expertise totally on this area. BOTOX® Cosmetic is used to treat "frown lines" which are sometimes called "scowl lines" or "worry lines". These are the lines seen between the eyes and on the bridge of the nose. In addition, BOTOX® Cosmetic injections are used for "crow's feet" wrinkles and forehead wrinkles. BOTOX® Cosmetic also can be used for the bands that develop underneath the chin and extend to the neck. Botox Cosmetic is also used by Dr. Niamtu to treat migraine headaches, bruxism (tooth grinding) and some facial pain syndromes. The treatment of protruding ears, otoplasty, is a very rewarding procedure for both the surgeon and the patient, especially in children. Children with protruding ears are often teased by their peers which can lead to serious body image problems, or in extreme cases, psychological problems. Helping a young person feel better about themselves and improve their self esteem is a true pleasure. Dr. Niamtu will perform this surgery free of charge for children with families unable to pay for the procedure. Dr. Niamtu is well known in international cosmetic facial surgery circles as surgeon, teacher and author and is regarded as a key opinion leader by academics and clinicians worldwide. He is a fellow of the American Academy of Cosmetic Surgery and the American Society for Laser Medicine and Surgery. He is board certified by the American Board of Oral and Maxillofacial Surgery and The American Board of Cosmetic Facial Surgery. His practice is limited to cosmetic facial surgery. He has Cosmetic Surgery Procedures Certification from the Commonwealth of Virginia, Department of Health Professions. He maintains cosmetic surgery privileges at several local hospitals. He lectures internationally on cosmetic facial surgery and has taught on six continents around the world. He has written four textbooks as well as 30 chapters on other textbooks. He has authored hundreds of publications on various cosmetic facial topics and a cosmetic facial surgery DVD series. Dr. Niamtu is a prolific author and opinion leader and one of the most featured authors in the cosmetic surgery literature. His opinions, techniques, and teachings are commonly featured in national and international publications. View All "In the News"
Dr. Niamtu is great! He preformed my lip argumentation and corrected a small indentation on the side of my nose. The results look very natural. Most importantly, he genuinely cares about his patients and works to ensure they are satisfied with the results. I honestly wouldn't let anyone else touch my face. I highly recommend him.